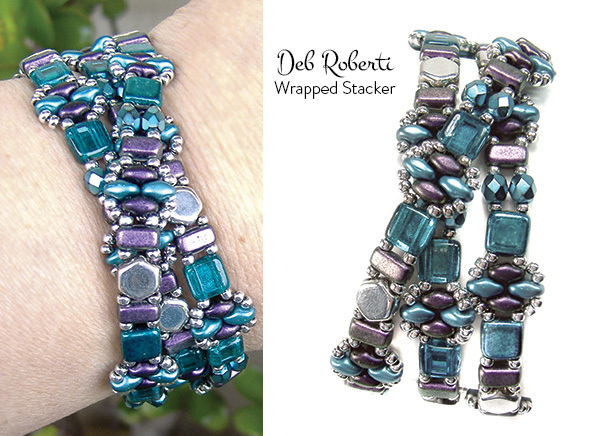 I combined elements from my Stackers pattern to create this easy wrap bracelet. Wrap bracelets make excellent gifts because you don’t have to worry so much about wrist size. Step 1: You’ll need about six yards of FireLine for this bracelet so thread your needle with a length of FireLine that you feel comfortable working with and add more later. Go up through the right hole of a Brick bead, around and down through the left hole of this same Brick bead. String a seed bead and a 4mm bead. Step 3: String a seed bead, a Color1 SuperDuo bead, a Color2 SuperDuo bead, a Color1 SuperDuo bead, a seed bead and another brick bead. Step 4: String a seed bead. Step 5: String a Color2 SuperDuo bead. Step 6: String a seed bead. Step 7: Go back up through the seed bead, the right hole of the Color1 SuperDuo bead, the left hole of the Color2 SuperDuo bead, the right hole of the Color1 SuperDuo bead, the seed bead and the right hole of the Brick bead highlighted in RED. Step 9: String two more seed beads. Step 11: String two more seed beads. Step 12: String a seed bead, a Honeycomb bead, a seed bead and a Brick bead. Step 13: String a seed bead. 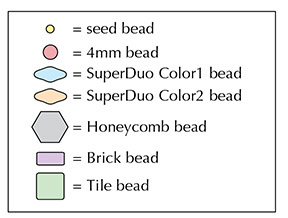 Step 16: String a seed bead, a Tile bead, a seed bead, a Color1 SuperDuo bead, a Color2 SuperDuo bead, a Color1 SuperDuo bead, a seed bead and another Tile bead. Step 17: String a seed bead. Step 18: String a Color2 SuperDuo bead. Step 19: String a seed bead. Step 20: String another seed bead. Step 25: String two more seed beads. Step 27: String two seed beads. Step 28: String two more seed beads. Step 29: String a seed bead, a 4mm bead, a seed bead and a Brick bead. Step 30: String a seed bead, a 4mm bead and a seed bead. Step 32: Repeat Step 3 to Step 31 (make your last repeat end with Step 11, 15 or 31) until your bracelet is the length you want it, minus about a half-inch and the length of your clasp. Step 33: To attach one end of the clasp, string a seed bead, a 4mm bead, two seed beads, a 4mm bead and a seed bead. Step 35: String a seed bead. Go through the clasp and then back through the seed bead that you just strung. Go down through the seed bead, the 4mm bead and the seed bead highlighted in RED. Step 37: To attach the clasp to the other end of your bracelet, thread your needle with the tail thread from Step 1.